Lauren Jones Worth describes her paintings as a combination of magical realism and abstract geometrical shapes. 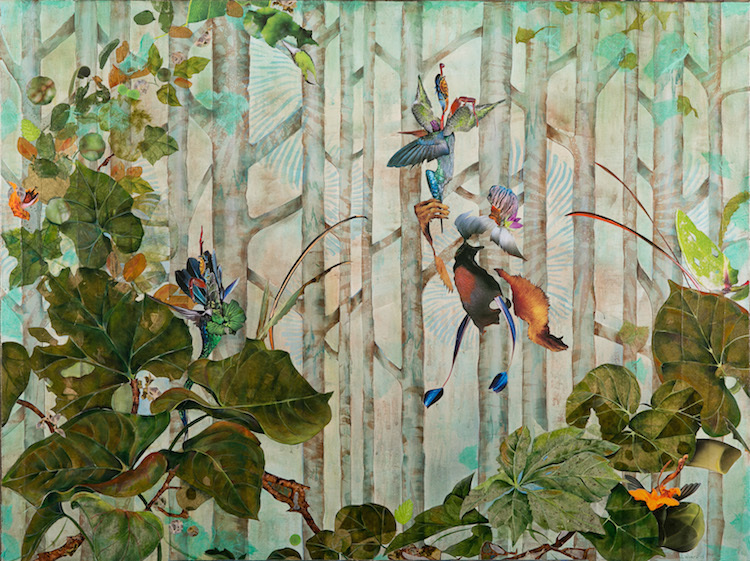 Employing collaged materials and a painterly aesthetic, Worth explores the nature and definition of beauty in the natural world. Naturally occurring aberrations make the plant world a more beautiful place. Charles Baudelaire put it, “Strangeness is a necessary ingredient in beauty.” Worth takes fish, fowl, flowers, and insects out of their natural context and mixes them with magazine photos of fabric, animals, sea life, and ancient artifacts to form a garden that is both natural and unnatural. Beauty can also be dangerous and deceiving. Manmade chemicals in our air, soil, and water cause abnormalities with biological effects that often go untested. GMO’s may provide us with the perfect color for our tomatoes, but do we really know the associated long term health effects? Are we attracted to a beauty that is good and true or are we merely victims of a ploy that tests our own desire to taste the forbidden fruit? And once we succumb, we often find that what first so enticed us is luscious on the exterior but toxic and deadly below the surface.